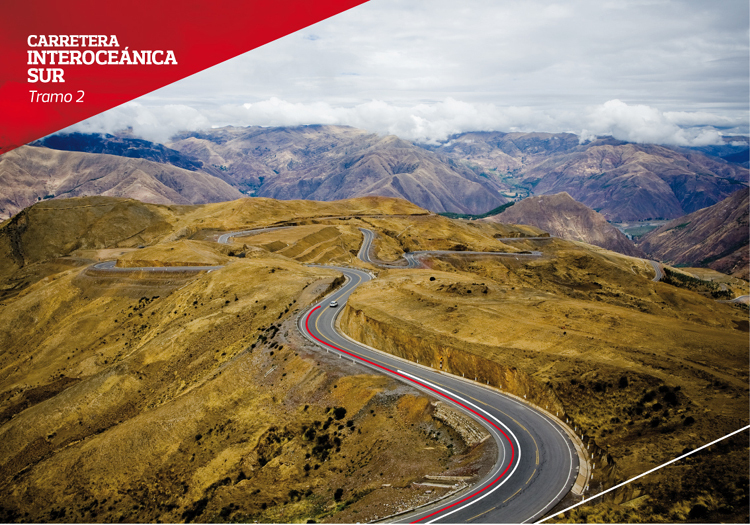 Since 2005, Concesionaria IIRSA Sur, an Odebrecht Latinvest company, operates and maintains 656 kilometers of highway, built during 2005 and 2010, that comprises section 2 and 3 of the South Interoceanic Highway, located in the regions of Cusco and Madre de Dios in Peru. Using the highest quality standards to be able to offer the user an enjoyable and save trip, the highway offers different services along the route, such as Emergency SOS posts, roadside assistance, patrolling and surveillance, restrooms in their 4 integrated toll and weighing units (Unidades Integradas de Peaje y Pesaje -UIPP), free WI-FI at the UIPP, air and water service for the vehicles, and a personalized and specialized treatment for each traveler. Quality infrastructure, with an engineering developed specially for the geographic, edaphic and ecologic characteristics of the traveled territory. Improvement and reduction of the travel time between Cusco and Iñapari, Made de Dios at the border with Brazil from weeks to hours, which represents a saving on the maintenance of the user’s vehicles, reduction on the use of spare parts, among others; and a reduction on logistical costs for transportation companies that connect cities from Cusco to Madre de Dios, Bolivia and Brazil. Strengthening and development of new business and productive activities for the influence scope of the highway: Community rural tourism and production of pineapple, papaya, cocoa, flowers, foliage, alpaca fiber, handcraft and guinea pigs. Growth on the value of the export made to Brazil through the Interoceanic Highway in 2014, it was 900% in regards to 2011, which was the year the construction of the highway was over. Emergence of new formal transport companies; nowadays there are 17 passenger transport companies offering security to the travelers going to 7 national and 3 international destinations.